Accusing the Congress party of launching 'fake campaigns' against the defence forces, judiciary and Reserve Bank, Union Minister Arun Jaitley Sunday said it is time to protect the country as well as its institutions from 'institution wreckers'. In a hard-hitting Facebook post, the minister recalled how the Congress-led governments used to interfere with institutions like the RBI, judiciary and the Central Bureau of Investigation (CBI). "It is about time that India and its institutions are protected from these 'institution wreckers'," said Jaitley, who Saturday returned from the US after medical treatment. In the post titled 'Institutions Under Attack - The Latest Fabrication', Jaitley said the past two months have witnessed several "fake campaigns" which failed to cut much ice as falsehood does not have longevity. The 'compulsive contrarians' continued to jump from one falsehood to another, he said. Jaitley said in West Bengal, democracy is seriously under peril. "BJP leaders can't land, public meetings are being prevented and the Rath Yatra was disallowed. The Congress Party's stand on multiple issues is self-contradictory. It slaughters a cow before the cameras in Kerala, and invokes the National Security Act against the cow killers in Madhya Pradesh," he said. There are two critical features of these new emerging breed of institution protectors'. They criticise the government the maximum and simultaneously argue that the free speech is in danger, Jaitley said. "They shed crocodile tears for democracy and make every effort to convert the world's largest democracy into a dynastic one," he said. "The Congress aligned with the Maoist in the recent Chhattisgarh elections. Rahul Gandhi stood shoulder to shoulder with the 'Tukde Tukde' gang at the Jawaharlal Nehru University. The Congress was in the forefront of defending the urban naxals in court. And yet it claims to be friend of both, the idea of India and its institutions," Jaitley said. He said these 'institution protectors' support the legitimising of illegal infiltrators into India. They readily jump to the support of those who want to dismember the country, he said. Accusing Congress President Rahul Gandhi of stalling functioning of Parliament, Jaitley said his two speeches on Rafale are based on a personal hatred for the Prime Minister emanating from envy. "History will record that Pt. Jawaharlal Nehru's great grandson has singularly damaged India's Parliament as an institution more than anyone else," he said. The minister said the Congress attempts at 11.00 am every morning to disrupt both houses of Parliament. "If we analyse Rahul Gandhi's two speeches on Rafale, they are based on a personal hatred for the Prime Minister emanating from envy. A failed student always hates the class topper. Additionally, the context of the speeches points more to college-level lumpenisation in content. "It has been left to two opposition members namely Bhartruhari Mahtab of the BJD and N.K. Premachandran of the RSP to fill up the intellectual vacuum that the Congress has created," he said. On Rafale, Jaitley said the deal not only strengthens the combat ability of the Indian Air Force but saved thousands of crores for the exchequer. "When its falsehood collapsed, its creators by producing half a document lost their full credibility. They forgot that truth always prevails," he said. 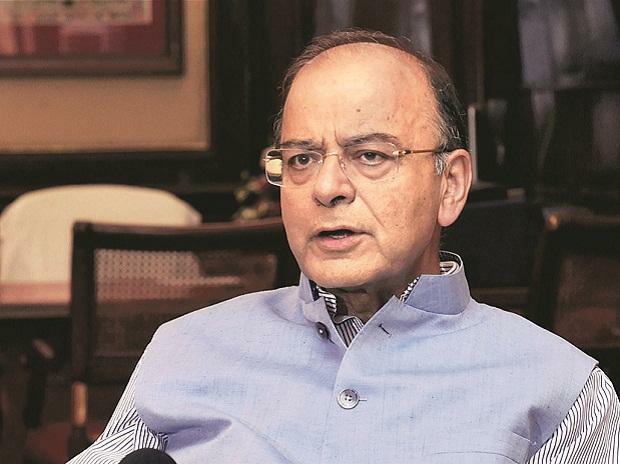 Accusing the Congress of organising loot on the banks between 2008-2014, Jaitley said the party is now alleging that industrial loans had been waived. "Not a single rupee was waived. On the contrary, the defaulters have been thrown out of management & Congress's falsehood was exposed," he said. Stating that the government has consistently maintained an arm's length distance with the Election Commission, he said the attack on the EVMs is not merely to allay defeat, it is an attack on the commission. He also said it is the Opposition which questioned first the existence of the surgical strike and then played it down as a routine action which has also taken place in the past. "The Army Chief was described as a 'Sadak ka Gunda'. Serious doubts have been raised on the Air Force led choice of the combat aircraft Rafale and its negotiation process. In the face of all this, they allege that institutions are under attack by the Government would be a mockery he said. On RBI, Jaitley said Congress governments in the past have been liberal in asking governors of the central bank to quit. "Pt. Nehru, Mrs. Indira Gandhi and subsequently Mr Yashwant Sinha had asked Governors to quit. During the UPA Government, two Governors were barely on speaking terms with the Finance Minister. Nothing of this kind has happened in the recent past, he said. The government legitimately flags the issues relating to liquidity and credit availability with the RBI, Jaitley said. "The Government is the principal manager of the nation's economy. How can raising legitimate issues relating to credit and liquidity availability be an interference with the RBI. The Government consistently maintained communications with the RBI Governors during its tenure," Jaitley said. Stating that the government does not interfere in any investigative function of CBI or any other investigative agency, Jaitley said restoring the credibility of an investigative agency is strengthening the institution and not assaulting it.